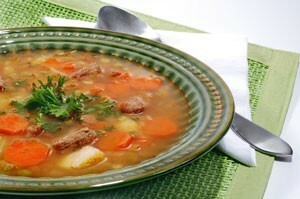 It is easy to make your own soup and stock from scratch, by following a few simple steps. This is a guide about making homemade soup and stock. When making a batch of turkey stock the other day, I needed a large glass container to put it in to allow it to cool. The only one I could find was my old sun-tea jar - a very happy accident! It turned out to be the perfect stock-separator: large enough to hold all the stock from my 8 quart stock pot, and it's made of glass, so no yucky plastic-chemical-leaching. I used a basket strainer and poured the stock in through it. The design of the jar (being for dispensing beverages) means the stock can cool in it (I put it in my sink in a cool water, followed by ice-water bath) and this allows the fats to separate and rise to the top. The dispensing spout sits about 1/2 inch from the bottom of the jar, which allowed the sediment to settle, and is not released when I turned the spout to "open" to fill my quart containers that go in the freezer. (I also rubber-band a paper coffee filter over the the spout to further filter out any fine impurities.) I just turned the spout to "off" when it got close to the fat layer. It used to take so long to scoop off the fat, strain the stock, etc., so I was very happy to discover this little trick, and I just had to share! I like to cook large batches of stews, chili, soup, etc. to eat, freeze, or give to friends. For this I use a large stock pot. When I decided to buy one years ago (stainless steel; I'll settle for nothing less) I discovered they were all very expensive or very thin. So I bought a thin one for $15 (on sale), went by a scrap yard and picked up a piece of scrap 1/4 inch aluminum large enough to cover the entire pan bottom ($3 or $4), and cut it down to fit. Then I'd just sit the aluminum on the burner and sit the pot on it. This helps greatly to dissipate the heat evenly under the pot, thus avoiding hot spots and burnt food without spending a fortune for a thick-bottom pot. One caveat: aluminum is the very devil to cut. Being soft, it gums up hacksaw blades, cutting wheels, etc. Measure the base of your pot and try to find a piece of scrap as close to size as possible. During my maternity leave we had only one income and I looked for ways to cut back on food bills. I kept cut-off tops/bottoms of carrots, asparagus, potato peels, cabbage cores, and any other veggie I used and placed them in the freezer. I served chicken on the bone and before serving the chicken, I de-boned it and saved the bones in a bag in the freezer as well. When I had enough veggie tops and bones, I made soup with them. I simply added rice and an egg and we had two meals from it. We loved soup and had it for a meal once or twice a week with a salad and crusty bread. Bouillon cubes are basically flavored squares of salt, whereas the paste bases are not as high in salt, and impart a much better flavor. You only use one or two tablespoons and the bases come in beef, chicken, mushroom, lobster, etc.. You can find them in the soup aisle, usually on the top shelf in small jars. You'll notice a big difference in flavor! If you make your own consomme out of meat stock, boil egg shells in the finished stock for half an hour, and then strain. The shells clear the cloudiness wonderfully leaving you with beautiful, translucent liquid consomme. When making homemade chicken broth, after it cools down, freeze it in an ice cube tray. Then when frozen, take the cubes and put in freezer bags. This is handy when you want to add a small amount to rice, mashed potatoes, and noodles. With all the cold weather we have been having, a bowl of steaming soup brings us back to our mother's and grandmother's kitchens. Soup is a labor of love. Even if you don't like to cook, most of us can heat a can of soup and magically be brought back to that time and place. I save all veggie peels, cooking water, cores, meat bones, etc., and always have a pot simmering on the woodstove. I am assured of having homemade soup stock on hand at all times. However, as much as we love it, my finicky teenaged daughter refuses to sample my soups du jour. After heating up your left over broth, use a strainer and strain the broth. You now will be left with clean, clear broth just like it was freshly cooked. Make a joint of meat (or a turkey or chicken) last a week by boiling the bones to make stock for soup. Just cover with cold water, bring to the boil and simmer for two hours. I made homemade chicken noodle soup. 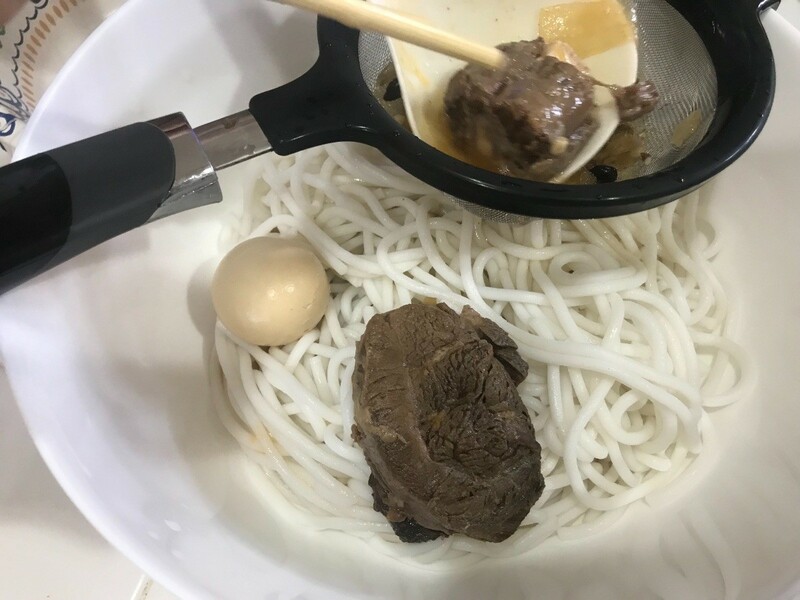 After storing overnight in the refrigerator, I noticed the noodles had absorbed most of the broth. How do keep this from happening? It's a really old post, from 2008. But I did a little internet research and it looks like there are a few possibilities on how commercially canned soup keeps the noodles from getting soggy. One might be that they don't cook the noodles entirely, but add them into the mixture only partially cooked. That way, the noodles can slowly absorb the liquid after being canned. People also suggest that egg noodles are generally used instead of pasta. Egg noodles don't absorb as much water. Or they might just be really small noodles that don't feel so mushy when the canned soup is eaten. Chicken stock is not hard to make and it creates a perfect base for endless soup variations. 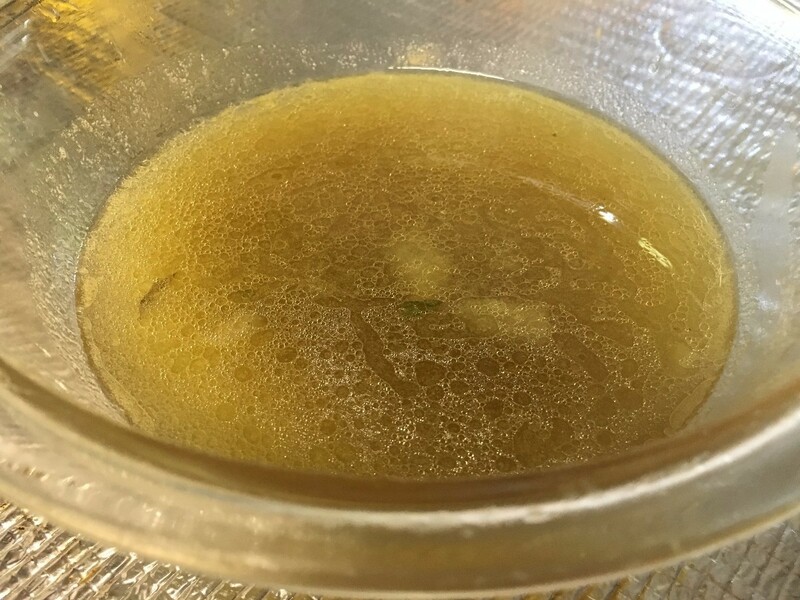 This is a guide contains an easy homemade chicken stock recipe. My mom taught me how to save quite a lot by adding leftovers to a zip lock freezer bag until it was full and then later thawing it out in the soup pot. 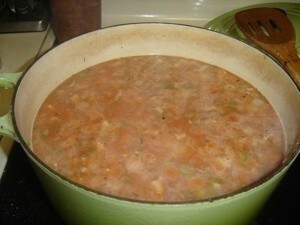 The fluid from cans of vegetables goes into it too,as well as leftover gravy and meats cut into small pieces. Pork goes well with the beef. I have shared this way of soup making with several people and have given the frozen bags away. Everyone loves it. If you like noodles or pasta, add it too! It's a fun way to use leftovers or clean out the ice box before food goes bad. I like adding a little BBQ sauce for a zesty flavor. For people who don't have a lot of time to make a nice soup, this is wonderful! I have a bag of it in my freezer now that I started with leftover bite sized red and yellow Bell peppers I cut for my son but didn't get eaten. I was at a diner not too long ago and their gravy was awesome so when I was asked if I wanted more, I said I would take it in a TO GO box! I explained my plan for it in my soup. When I got home I emptied the little dish of gravy into the freezer bag. I got my BIG HA HA about being so frugal with my diner take-out of gravy enhanced soup. I take all the leftovers (steak, chicken, ham, meat loaf, broth, etc.) that there aren't enough of for another dinner and put them in the bucket (I use an old ice cream bucket but you could use tupperware). When it looks like there's enough (4-6 cups) I put them in my crockpot with a jar of spaghetti sauce (the cheap 99 cent kind) and whatever herbs and seasoning I feel like. For example, a couple of bay leafs and maybe some onion soup mix. Before I had a crockpot, I just simmered this in a pot for an hour and 1/2. This usually makes 2 to 3 meals for my family of 6. Happy eating! Your recipe sounds delicious! I used to do a version of this. I'd keep 4 tupperware containers in the freezer door: 1. Leftover bits of chicken 2. Leftover beef bits 3. Leftover pork bits 4. Leftover veggies, a teaspoonful here or there adds up over time. These containers are wonderful for stir fries, for soups, for omelets, for (combining the beef and pork, yum!) barbecue which is delicious on buns. This wasn't my original idea; I found it in a wonderful budget cookbook I don't have anymore but I'd give the world to find again. Those teaspoonfuls you'd otherwise throw away will add up to many "found" and delicious meals over time.